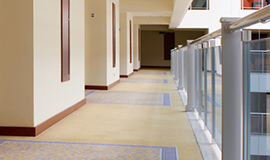 Summer, spring, winter, fall – no matter the season the carpets in your commercial building are bound to get dirty. Whether your employees are tracking in mud, dirt, leaves, or lunch, your carpet is usually the victim of stains and wear. When your carpets take on a dingy appearance, contact our expert team for commercial floor cleaning in San Antonio. Steam cleaning is our specialty, and with our professional grade equipment, we can get return your carpets to their former glory. You do not have to try and cover up messes, let alone have to take care of the damage yourself. With Steam Master Cleaning and Restoration, we offer commercial carpet cleaning so you can take your mind off your dirty carpets and focus on your business at hand. Nothing says your business matters like clean carpets. Protect your investments and show off your carpets with Steam Master Cleaning and Restoration. Whether you would like a one-time deep clean or would like to schedule routine visits, what is important is that your carpet looks outstanding at all times. When you work with Steam Master Cleaning and Restoration, you and your business are put first, ensuring that your needs are taken care of. With many years of industry experience, you can trust that when we say clean, we mean clean. We focus on implementing high-quality techniques combined with top-of-the-line products to leave you with a carpet cleaning that is unmatched. Paying attention to all the details, we remove stains, restore your carpet, and leave your commercial building feeling fresh. Let us show you what we can do. Contact us for your free bid and get in touch with one of our expert cleaners to schedule your commercial floor cleaning in San Antonio today. We are the carpet steam cleaner team you can trust!